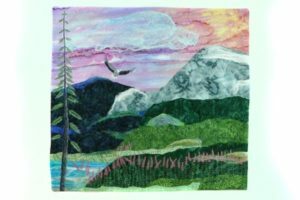 June 27, 2018 – Salinan Shawn Delker will display an exhibit of her art quilts in Salina Public Library’s Gallery 708 June 29 through July 27. A reception for the artist will be from 4-5:30 p.m. July 6, in conjunction with Friday Night Live. The exhibit, titled “Contemplate,” will include fiber art pieces that incorporate linen, wool and silk, as well as traditional cotton. Delker also uses unwoven silk in a process that turns it into a fabric and dyes her own silk for some of her work. The public is welcome to view the exhibit during library hours — 9 a.m.-9 p.m. Monday-Thursday, 9 a.m.-6 p.m. Friday and Saturday, and 1-6 p.m. Sunday. For more information on art exhibited at the library, please contact Lori Berezovsky at infoservices.lori@salpublib.org, (785) 825-4624, ext. 249, or visit library at 301 W. Elm.